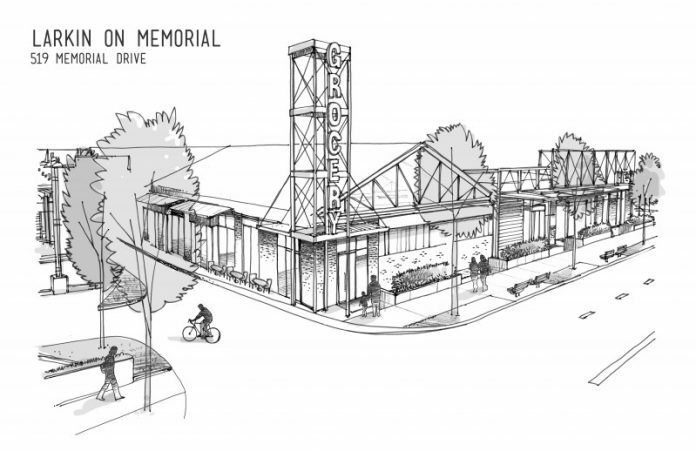 The team behind the Candler Park Market recently announced they will open a larger project called the Grant Park Market next year. It’s part of Larkin on Memorial, a new development by Paces Properties (best known for Krog Street Market). Grant Park Market general manager and co-owner Greg Hutchins says he hopes the market, which will offer natural and organic groceries, beer and wine tastings, a deli, and a hot bar, will be operational no later than March 2017. He shares details below. Why’d you decide to open Grant Park Market? We’ve been running Candler Park Market for the past 13 years and developed a nice relationship with the neighborhood. Paces Properties told us about their plan, and we thought it would be a really good fit for us. We were attracted by the whole idea of a small-town shopping experience inside of a big-city shopping plaza. It’s a throwback to the old style of living where people would go to their downtown square and hit their local dry cleaner, grocery, and shops, instead of one big box store. That’s always appealed to me. Tell me about the offerings you have planned. At Candler Park Market the split is about 60-40 with natural and organic versus traditional groceries. I expect a similar split but with more natural and organic products. We’re looking to partner with local farms and the farmers at nearby markets for produce. What’s on the menu at the deli and hot bar? The deli will be more of a focal point of the store and there will be a walk-up window accessible from the common seating area in the public space. We’ll have a few more offerings [than Candler Park Market] because we’ll have a better kitchen and better systems. The current menu at Candler Park has deli-style sandwiches like reubens and chicken salad with some Southern flare. We also do hamburgers and grilled chicken. We’ll expand upon both hot and cold items. We have a lot of time to experiment and figure out what to add. We’ll have more prepared foods–cold grab ‘n’ go-style but also a hot bar, probably with things like lasagna. Ideally you’d want to have a lot of rotation of items but some consistency as well. How will the beer and wine tastings work? It depends on what kind of liquor license we can obtain. We are going to ask for the ability to have an area where you can drink in the store, where someone can order a glass of wine or beer and we can serve them. Otherwise, it may just be tastings during certain times. We’d have complimentary basic tastings, but the more involved ones with a larger list and specialty items we might charge for. What will the market look and feel like? We’re still working on it but hoping for a warm, inviting space. I can tell you the building will have 4×4 rafters cross the roof to create a stunning roofline with open glass in front of it for natural light.